When you walk down the cat food aisle at your local pet store, what do you see? You probably see rows upon rows of not only bags of cat food, but cans of wet food as well. If you take a closer look, you will come to see that wet cat food is just as varied as dry cat food in terms of flavor options and different formulas. Many cat food manufacturers offer multiple formulas within their own brand which leaves you with a nearly unlimited number of options to choose from. As if this isn’t overwhelming enough, there are also several different types of wet cat food to consider. Both dry cat foods and wet cat foods have their advantages and what works for one cat might not be the same thing that works for your cat. To make sure that your cat gets the nutrition he needs you should take the time to learn about your options and to select a quality product. In this article you will receive a wealth of information about wet cat food so you can determine whether or not it is the right choice for your pet. If you do decide to feed your cat wet food, you will also find some helpful tips and tricks for choosing a high-quality product. You will also receive recommendations for quality wet cat food brands to help you get started. Paté – The true definition for paté as it refers to food is, “a spread of finely chopped or pureed seasoned meat”. In terms of cat food, a pate is typically a pureed food that is packed into cans and it is a little bit more solid and compact than flaked or shredded foods as well as foods in gravy or broth. Flaked/Shredded – One of the most common types of wet cat food consists of flaked or shredded meats in water or broth, thickened with some kind of flour or gum. Some recipes may also include bits of cheese as well as bits of fruits or vegetables. Meat in Gravy – This wet cat food often comes in pouches rather than cans and they typically consist of some kind of meat in a thickened gravy. This type of wet food tends to be fairly high in calories so it is often used as a supplemental food rather than a staple diet. Meat in Broth – Similar to meat in gravy, this type of cat food is often sold in pouches and it consist of some kind of meat in a flavored broth. These foods may also include vegetables and they often come in stew-like flavor combinations. Semi-Moist – This type of cat food used to be very common but it eventually came to light that the preservatives used in these products were causing health problems like anemia in cats. These foods also tended to be higher in sugar and calories than other foods. The only kind of semi-moist cat food you are likely to see on the pet store shelves today is in the form of treats. Again, different cat food brands do not always offer the same kinds of wet cat food. Some of the lower- to mid-quality brands like Fancy Feast and Friskies offer the greatest selection in different types of wet food while higher quality brands tend to offer a smaller selection. If you are trying to decide which kind of cat food to feed your pet, your two main options are dry food (or kibble) and wet food. Both options have their pros and cons so you should consider the advantages and disadvantages of both before you make your decision. One of the main benefits of wet food over dry food is improved digestibility. The term digestibility refers to the degree to which a certain nutrient is absorbed by the cat’s digestive tract and utilized by the body. Canned cat foods tend to have fewer “extra” ingredients which only serve to bulk up the food, making it less expensive to produce for the manufacturer without adding any real nutritional value. One way to judge the digestibility of a cat food product is to keep an eye on your cat’s stools. Cats on a low-quality diet tend to pass stools more frequently, often three or more per day, versus an average of one per day for cats on a high-quality diet. This is because the indigestible parts of the food pass through the digestive system, absorbing water as it moves along. A potential benefit of high-quality canned food versus dry food is fewer and firmer stools, though cats on a high-quality dry food diet may exhibit this as well compared to lower quality dry food diets – it is not necessarily just a benefit of wet cat food. Another benefit of wet food versus dry food is higher nutrient values. Wet cat food products tend to contain more protein and fats than dry food products – they also tend to have lower carbohydrate content. To compare the nutrient values of a wet food to a dry food product, keep in mind that you will have to convert the wet food values to a dry matter basis in order to make a direct comparison. To do so, take the total moisture content and subtract it from 100% – this will leave you with the total amount of dry matter. Then, simply divide the whole number value of each nutrient (protein, fat, and fiber) individually by the total dry matter content. For example, a wet cat food with 78% moisture has a total dry matter content of 22%. If the protein content is 10%, you simply divide the 10% by the 22% for a protein value of 45%. You can repeat this for the values for fat and fiber to make a comparison. Many cat owners find that their cats seem to prefer wet foods over dry foods for their flavor and palatability. The fact of the matter is that some cats simply do not like crunchy foods – wet foods are closer to the texture and flavor of fresh meat which can make the product more palatable. Some cat owners also find that their cats exhibit higher energy levels on wet food than they do on dry food. This may be due, in part, to the increased digestibility of wet food products which leads to better nutrient and energy absorption. Wet foods can sometimes help to decrease the frequency of hairballs in cats and they may also improve the health of the cat’s skin and coat. Though there are many benefits associated with wet cat food, there are also some downsides to consider. One of the major disadvantages of wet food over dry food is the cost – cans of high-quality wet food can cost upwards of $2 each or a single day’s ration while a large bag of quality dry food might cost $30 but last a month or more. Dry cat foods have a longer shelf life than canned foods (once they are opened), and they generally do not require refrigeration to remain fresh. Some veterinarians say that dry cat food helps to scrape plaque and tartar off the surface of the cat’s teeth during chewing, helping to reduce the risk for dental disease while wet cat food does not. Most veterinarians agree, however, that additional oral hygiene is still needed to prevent dental disease in cats. In the end, it is up to you whether you want to feed your cat dry food or wet food – you have been introduced to the pros and cons of both sides so you can make an informed decision. Even if you choose to feed your cat a staple diet of dry cat food, you may still want to feed small amounts of wet food on a daily basis to help round out his nutrition and to provide skin and coat benefits. If your cat is a picky eater, mixing a little wet food into his dry kibble may make it more appealing. When it comes to choosing a high-quality wet food product for your cat, you can’t always believe what it says on the package. The American Association of Feed Control Officials (AAFCO) is responsible to some degree for regulating what goes into pet foods and livestock feed, but the claims made on pet food packages are not closely regulated. For example, there is no AAFCO- or FDA-approved definition for words like “premium” or “gourmet” as it applies to pet food. Many pet food manufacturers use buzz words like this to make pet owners think that their products are of higher quality than they actually are. If you take the time to evaluate the ingredients list against the claims made on the packaging, you will find that they do not always match up. When comparing different wet cat food products, there are three key things you should look for on the package. The first is an AAFCO statement of nutritional adequacy. The American Association of Feed Control Officials (AAFCO) is responsible for regulating the production and manufacture of pet foods and livestock feed. This organization has determined the minimum nutritional requirements for cats and dogs according to specific nutrient profiles for maintenance (adult cats) and growth/reproduction (kittens and pregnant or lactating females). AAFCO compares these profiles to the nutritional content of pet food products and determines whether or not they meet the minimum requirements – if they do, the package will carry a statement declaring such. This statement generally looks something like this, “[Product Name] is formulated to meet the nutritional levels established by the AAFCO Cat Food Nutrient Profiles”. If the cat food product you are looking at doesn’t carry this kind of statement, it will not meet your cat’s nutritional needs and it shouldn’t be used as a staple diet. In addition to looking for the AAFCO statement, you should also take a glance at the guaranteed analysis on the package. All pet food labels are required to provide a breakdown of the percentage values for four key nutrients – protein, fats, fiber, and moisture. It is optional to include other nutrients like taurine, omega fatty acids, or various minerals but it is not required. You have already learned how to calculate the dry matter basis (DMB) for the guaranteed analysis of wet food products but you should also know what kind of numbers you should be looking for. 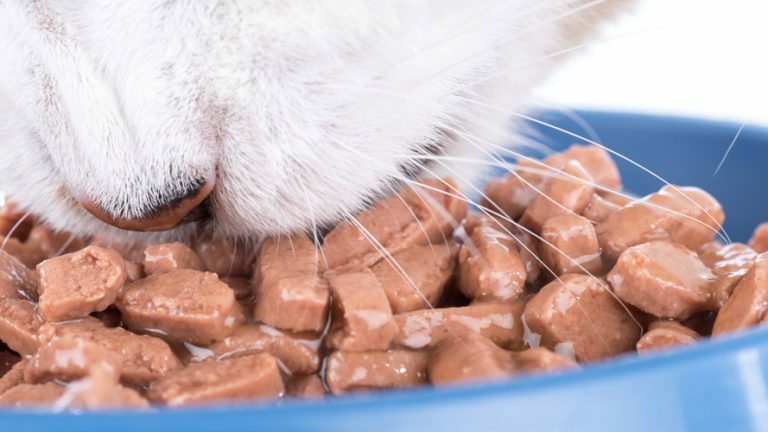 A high-quality wet food product will generally contain a minimum protein value of 45% DMB and the fat content should be in the 25% to 35% DMB range. For carbohydrates (listed as crude fiber) you should not be looking for a minimum value, but a maximum value – no more than 10% is ideal. After you’ve checked out the AAFCO statement and the guaranteed analysis of the wet food product, your final stop is the ingredients list. Remember, the ingredients list for pet food products (and for the food you eat) is listed in descending order by volume – ingredients that appear at the top of the list are present in higher quantities than ingredients at the end of the list. Protein is the most important nutritional consideration for cats so you want to see at least one, ideally two or more, sources of whole animal protein at the beginning of the list. One thing you need to remember about wet food products, however, is that they require a great deal of moisture – you shouldn’t be surprised to see water or broth as the first or second ingredient. What you do not want to see at the top of the list is some kind of grain or other carbohydrate – especially something like wheat flour or corn gluten meal which not only contain limited nutritional value but also pose the risk of triggering food allergies. When it comes to protein for cats, the best sources are fresh meats and meat meals. Fresh meats like chicken, turkey, fish, lamb, and others are much more biologically valuable to your cat than plant proteins – this simply means that your cat’s body can more easily digest and absorb the nutrients from animal products than from plant products. Do not let the word “meal” throw you off if it appears after a quality protein source like chicken or salmon. The thing you need to know about meat meals is that they have already been cooked down to a moisture level around 10%. Fresh meats contain up to 80% moisture so, once the finished product is cooked, the actual volume of protein for that ingredient will be much lower. Chicken meal contains up to 4 times as much protein by volume as fresh chicken. In addition to quality animal proteins, you also want to see some animal fats on the ingredients list for a quality wet food product. Chicken fat may not sound like an appetizing ingredient to you but it provides your cat with essential fatty acids as well as a highly concentrated source of energy. Fish oils are also a good source of fat for cats because they contain omega fatty acids which are good for your cat’s skin and coat. Plant oils like flaxseed oil or canola oil are not necessarily bad for your cat but they are less biologically valuable than animal fats and are best used as a supplementary source of fatty acids and essential vitamins and minerals. It is important for you to realize that cats do not have a biological need for carbohydrates in their diet – their bodies simply aren’t designed to digest fibrous plant materials. In the wild, the only carbohydrates cats are likely to get come from the stomach contents of their prey – this means they have already been partially digested. When it comes to commercial cat food products, however, carbohydrates do provide some value in that they provide your cat with dietary fiber to form compact stools and to ensure healthy, regular digestion. Carbohydrates for cats should come from digestible sources like cooked whole grains (such as oatmeal and brown rice) or gluten-free options like tapioca and potatoes or sweet potatoes. The key is to find a product that includes digestible carbohydrates but not at a level that exceeds 10%. Too much fiber in a cat’s diet can actually interfere with digestion. The name of this company may seem strange but once you try their products it is not a name you will soon forget. Ziwipeak is an all-natural pet food company based out of Mount Maunganui in New Zealand and they source all of their ingredients locally. This company uses plenty of fresh proteins like New Zealand venison, lamb, beef, seafood, and shellfish and their products include all of the essential vitamins and minerals your cat needs. Their products are free from gluten, grains, and potatoes, plus they are made without any fillers, antibiotics, hormones, or artificial additives. What really makes this company unique, however, is the fact that they air-dry their dry food products – this helps to preserve the nutritional value of the ingredients while adding the convenience of a dried food product. While Ziwipeak may be best known for its air-dried pet foods, they also offer an assortment of wet cat food products. There are five different flavor options to choose from and they are all made from 100% fresh, all-natural, raw meat with natural moisture. The five flavor options are as follows: Beef, Lamb, Rabbit and Lamb, Venison, and Venison and Fish. Ziwipeak canned foods are retort-cooked to preserve the nutritional integrity of the natural ingredients and each recipe contains at least 66% raw meat. These products are available in 3-ounce or 6-ounce cans that can be purchased in specialty pet shops as well as some larger pet store chains and a variety of online retailers. With a name like “Addiction” you may be skeptical, but this brand is actually known for producing high-quality, nutritious diets for both cats and dogs. The Addiction Foods Company was founded in 2002 by a leading holistic veterinary surgeon and a clinical nutritionist – together they created a company that has become one of the biggest names in natural commercial pet foods. Addiction follows a unique approach to pet nutrition, formulating their recipes based on the natural diets of wild cats and dogs. Not only are these recipes loaded with quality nutrition, but they are also rich in natural flavor that pets find absolutely irresistible. Addiction offers a variety of pet food products including a line of all-natural treats for both dogs and cats. The Addiction Foods Company offers three different types of products: dry foods, raw dehydrated foods, and canned foods. Consumers have two options to choose from in dry foods, one option for raw dehydrated food, nine different options for canned foods. Within the Addiction line of canned food formulas you will find flavors like Black Forest Rabbit & Blueberries, Safari Buffalo Meatloaf, and New Zealand Venison & Apples. These recipes are rich in premium animal proteins that come from unique sources as well as fresh fruits and vegetables to provide nutritional balance. All of Addiction’s wet food products are grain-free, loaded with antioxidants, omega fatty acids, and essential vitamins and minerals. Plus, they are filled with natural flavor your cat is sure to love. Earthborn Holistic is an all-natural pet food company known for its holistic formulas made with wholesome protein, nutrient-rich fruits and vegetables, as well as a precise blend of vitamins and minerals. The Earthborn Holistic pet food company follows a wholesome approach to nutrition, using only the highest quality ingredients to ensure whole-body health and wellness. Each of their formulas is designed to ensure balanced nutrition and they are loaded with natural flavor your cat will love. Not only are their formulas highly palatable and incredibly healthy, but they come in a variety of flavor options to suit your cat’s individual preferences. Each recipe is guaranteed to provide top-notch nutrition that supports your cat’s physical and mental wellbeing. The Earthborn Holistic pet food company offers three holistic and grain-free holistic dry food formulas as well as seven moist grain-free holistic formulas. Choose from flavor options like Chicken Catcciatori, Catalina Catch, and Monterey Medley. Each of these wet cat food products is free from gluten and grains, and many of them feature nutrient-rich potatoes as an alternative source of fiber as well as essential vitamins and minerals. All of Earthborn Holistic’s products are made in human-grade facilities so you can be sure of their quality and they are free from artificial flavors, colors, and preservatives. Earthborn Holistic wet food products are available in 3-ounce and 5.5-ounce cans and they can be found in specialty pet shops as well as some larger pet store chains and a variety of online retailers. Now Fresh pet foods are produced and manufactured by the Petcurean Pet Nutrition Company. This company was founded by two friends in the Fraser Valley of British Columbia, Canada as a company devoted to providing pets with fresh, nutrient-rich foods. Today, Petcurean is still an independent company that follows strict standards for quality, providing cats and dogs with the nutrition they need to live long and healthy lives. The Petcurean Pet Nutrition Company offers three different product lines for cat food products – the Summit indoor recipe, the Go! line of high-protein and grain-free diets, and the Now Fresh line of grain-free dry cat foods. The Go! line of pet foods from the Petcurean Pet Nutrition Company includes both dry food and wet food recipes that are formulated to provide certain benefits. The Fit & Free recipe is made with maximum meat protein and zero grains or gluten, designed to help your cat achieve maximum performance and energy to stay healthy and fit. Flavor options include Grain-Free Chicken, Turkey & Duck Paté and Grain-Free Chicken, Turkey & Trout Stew. The Sensitivity & Shine formula is designed for cats with special dietary needs, prepared with select meat proteins, omega fatty acids, and unique carbs. Flavor options include Grain-Free Duck Paté and Grain-Free Freshwater Trout & Salmon Paté. The Daily Defense formula is packed with nutrients to provide your cat with the preventive care needed to ensure a long and healthy life. Flavor options include Chicken Stew, Turkey Paté, and Salmon Paté. Many cat owners believe that wet food is far superior to dry cat food, but there are pros and cons for both options. The best thing you can do is take the time to learn both sides of the story so you can make an educated decision for yourself and for your cat. If you do choose to feed your cat wet food, take the time to choose a quality product using the information provided in this article. Feeding your cat a high-quality diet will not only ensure his complete and balanced nutrition, but it will also help to ensure maximum longevity so you can enjoy his company for as long as possible.